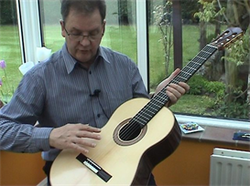 David has produced a number of films to entertain and teach classical guitarists many aspects of style and technique. Many of these films feature guest musicians at the very top of their field in the world of classical music. Here, you can sample each film with a short extract. These digital films have been compressed to make them a reasonable size to download, so don't expect HD quality. The sound quality however is very good, and the information excellent! Mac users may need to download free software to view these WMV files. click the link below for more information. "Playing Baroque music on the classical guitar" featuring David Miller, Maggie Cole, Stephen Gordon and David Jaggs. In this 87 minute film you will learn about the instruments of the day, baroque ornamentation, trills, inegal, campanella, dynamics, phrasing, and much more from leading players. There are also some lovely performances of Weiss, Scarlatti, Sanz etc. An absolute must for anyone interested in interpretation and style. This is a must for any classical guitarist learning John Dowland or other renaissance music. In this 37 minute lesson from one of the best lutenists in the world you will learn about ornamentation, phrasing, rubato, use of vibrato as well as a brief introduction to the lute and an explanation of tablature. Hear how many of these early techniques transcribe onto the guitar and find out about tuning, use of capotasto, thumb and index scales....... The list goes on. In this 30 minute film you will learn to play one of the classical guitar's most famous pieces, Romanza. In a step by step guide David takes you through every stage of learning this piece in far more detail than other similar films you may have seen. Discover the best fingerings for the piece, and learn about new practice methods. The score is included which is in both standard notation and tablature. 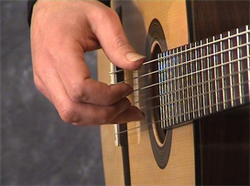 Learn all you need to know about making a great tone on the classical guitar. Fingernails, sitting position, hand position, it's all here with demonstrations, close up camera angles and high quality sound production. Join me on a day out to remember at Kent Guitar Classics. Meet guitar expert Miles Roberts, learn about and hear some of the finest concert instruments available. Guitars featured are Hauser, Romanillos, Oldiges, Rohe, Price, Fleta, Freiderich and Marin.